A Neighbourhood Plan for Sneinton? Many people have told us, through the Community Organisers, the Sneinton Vision project, our Place Check Walks and many other consultations over the years that they feel powerless when it comes to how Sneinton changes over time. Since April 2012, local communities have been able to produce "Neighbourhood Plans" for their local area, putting in place planning policies for the future development and growth of the neighbourhood. But what could this do for Sneinton? Many long term residents mourn the fine old buildings that have been knocked down and few appreciate the new buildings and spaces that have taken their place. It can seem to many of us that the planning system is not FOR us, but a way of developers negotiating with the Council over our heads. With this in mind, Sneinton Alchemy are holding a workshop to discuss a Neighbourhood Plan for Sneinton on Tuesday November 5th from 10am-2pm at TRACs. We have received support through Locality to bring in expert advice from Helen Metcalfe of Planning with People. If you are interested in attending, we have a few place available, please contact Steve Smith, Senior Community Organiser on 07972049539 or by email to stevesmth100@gmail.com . However hard our Councillors and the City planners work on our behalf, without a strong local voice stating what we want, it is hard to balance the pressure for economic development and the need to support a vibrant but disadvantaged community. Under the present system it seems like the only way to have influence as a community is through complaining and resisting change, but as the Sneinton Vision project showed local people know the area best and want to contribute positive ideas for the future. Find out more about Neighbourhood Plans from the My Community Rights website. 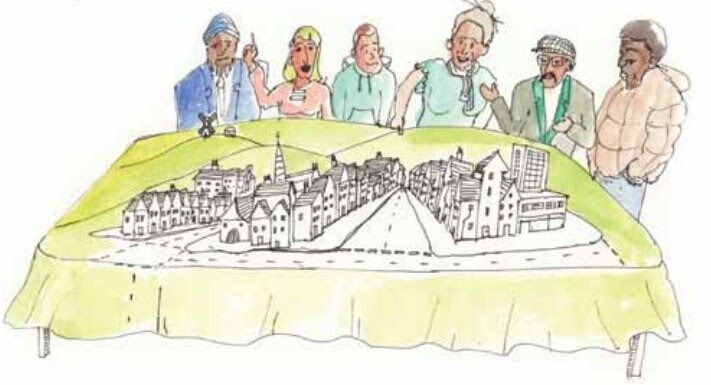 The image here is published by Locality in it's Quick Guide to Neighbourhood Plans document.